The 2016 Woodruff Library Undergraduate Research Award winners are, from left, Emily Moore, Zixuan (Armstrong) Li, Samantha Keng and Hannah Conway. Photo by Emory Libraries. Undergraduate Research Week, which kicked off Monday, showcases students' work across a range of disciplines. "The whole week is really an opportunity for the Emory community to explore, celebrate and be inspired by the research that Emory undergraduates have conducted over the course of the semester and the year," says Folashade Alao, co-director of Undergraduate Research Programs. In addition to the Emory Campus-wide Symposium on Wednesday afternoon, remaining Undergraduate Research Week events include Thursday's Undergraduate Research Programs Symposium, with poster and oral presentations from SIRE participants, from 3-6 p.m. in the DUC Coca-Cola Commons, and a poster session with short talks from Chemistry honor students on Friday from 3-6 p.m. in the Atwood Science Commons. Oxford College is also celebrating Undergraduate Research Week with a symposium on Friday, April 22, from 12-4 p.m. in the Akin Room of the student center. As Emory celebrates Undergraduate Research Week, the Robert W. Woodruff Library has announced the winners of its 2016 Undergraduate Research Awards, selected by a panel of judges. The awards will be presented at the All-College Research Symposium on Wednesday, April 20, at the Dobbs University Center. The winners, along with other student researchers, will share their work with the Emory community via poster presentations from 3 to 6 p.m. in the Coca-Cola Commons. Students, faculty and staff are encouraged to attend. Hannah Conway, “Behind the Lens of the Civil Rights Movement: The Power of Photography to Both Reveal and Conceal.″ Faculty sponsor: Carol Anderson. Samantha Keng, “Model Minority Awakenings: Vincent Chin, Asian America’s Emmett Till.” Faculty sponsor: Carol Anderson. Zixuan (Armstrong) Li, “Doner Kebab: Symbol of German Multiculturalism in the Turkish Immigration Question.” Faculty sponsor: Astrid M. Eckert. Each winning entry will receive a prize of $500, supported by the Elizabeth Long Atwood Fund. Emily Moore, “A Casket Full of Precious Memoirs: The Town of Washington’s Conception of Its Own History” (chapter three of Honors Thesis: “Strange Histories: A Cultural History of the Legend of Lost Confederate Gold in Washington, Georgia”) Faculty sponsor: Leslie Harris. 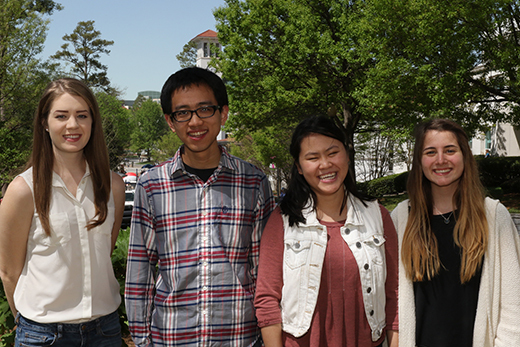 For additional information about this year’s Woodruff Library Undergraduate Research Award recipients, see the Spring 2016 issue of the Emory Undergraduate Research Journal, pages 66-69. The URA committee extends its thanks to the judging panel: Christopher Beck, Department of Biology; Gabrielle Dudley, Stuart A. Rose Manuscript, Archives, and Rare Book Library; Melissa Hackman, Women’s, Gender, and Sexuality Studies; Katie Rawson, Woodruff Library, and Sheila Tefft, Interdisciplinary Studies.